Pick up : We will pick up you at your hotel in Hoi An city at 08.00 Am to My Son Holyland,on the way you will stop for taking the nice photos of Vietnamese ricefields & buffalos.Then,you visit Tra Kieu . - Formerly called Simhapura (Lion Citadel), Tra Kieu was the first capital city of Champa, serving in that capacity from the 4th to the 8th centuries. Today nothing remains of the ancient city except the rectangular ramparts. A large number of artefacts, including some of the finest carvings in the Museum of Cham Sculpture in Danang, were found here. You can get a wonderful view of the city's outlines and the surrounding countryside from the Mountain Church (Nha Tho Nui), on the top of Buu Chau Hill. This modern, open-air structure was built in 1970 to replace an earlier church destroyed by an American bomb A Cham tower once stood on this spot. It's worth visiting the little shop at the bottom of the hill to look at a picture of the site in antiquity and peruse its collection of small artefacts. The Mountain Church is 6.5km from Hwy 1A and 19.5km from My Son- Within Tra Kieu, it is 200m from the morning market, Cho Tra Kieu, and 550m from Tra Kieu Church. At : 12.00 pm : You have lunch at the good local restaurant( 1hour stop for lunch) .After lunch,you go straight to Hue via Hai Van Pass,on the top of Hai Van Pass you will witness the clouds & the beautiful landscapes of Hue and Da Nang city (Hai Van Pass is the border between Da Nang & Hue City.) you stop on the top for 20 minutes.Then,we go straight to Hue & drop you off at your hotel in Hue City . 63 $USD= 1.400.000VND for a group of 1-4 Pax by private Car A/C. 85 $USD= 1.900.000VND for a group of 5-10pax by private 16-seated Van A/C. Including: english-speaking driver,car A/C or 16-seated van,and gasoline. Not including : Soft drinks & beer,lunch,entrance fees at the sightseeing. 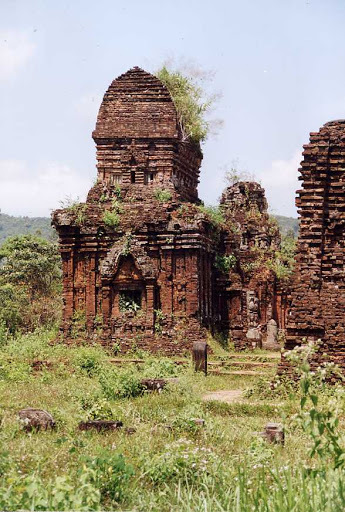 My Son, located 69 km southwest of Danang, was an imperial city during the Cham dynasty, between the 4th and 12th centuries. My Son Sanctuary is a large complex of religious relics that comprises more than 70 architectural works. They include temples and towers that connect to each other with complicated red brick designs. The main component of the Cham architectural design is the tower, built to reflect the divinity of the king. This church (Dia So Tra Kieu), which serves the town's Catholic population of 3000, was built in the late 19th century. There's a fantastic ceramic mosaic dragon on the external stairs. A priest from here, who died in 1988, was interested in the Cham civilisation and amassed a collection of artefacts found by local people. A 2nd-floor room in the building to the right of the church opened as a museum in 1990. The round ceramic objects with faces on them, which date from the 8th and 10th centuries, were affixed to the ends of tiled roofs. The face is of Kala, the God of Time. According to local belief this church was the site of a miracle in 1885, witnessed by 80 people. At that time, when the Catholic villagers were under attack by anti-French forces, a vision of a lady in white, believed to be Mary the mother of jesus, appeared on the top of the church. At the end of a 21-day siege during which 500 shells were fired on the village, the church and those who had sheltered in it remained unharmed. While not officially recognised by the Catholic Church, this is a popular site for Vietnamese pilgrims. The original Mountain Church was built to commemorate this event - although it didn't achieve such divine protection itself during the American War. Tra Kieu Church is 7km from Hwy 1A and 19km from My Son. It is down a street opposite the town's Clink of Western Medicine (Quay ThuocTayY). Expect to stop for directions.